The Maxwell Street Foundation maintains a collection of items since 1995, some of which were delivered to our hands anonymously having come from former Maxwell Street neighborhood buildings and storefronts. 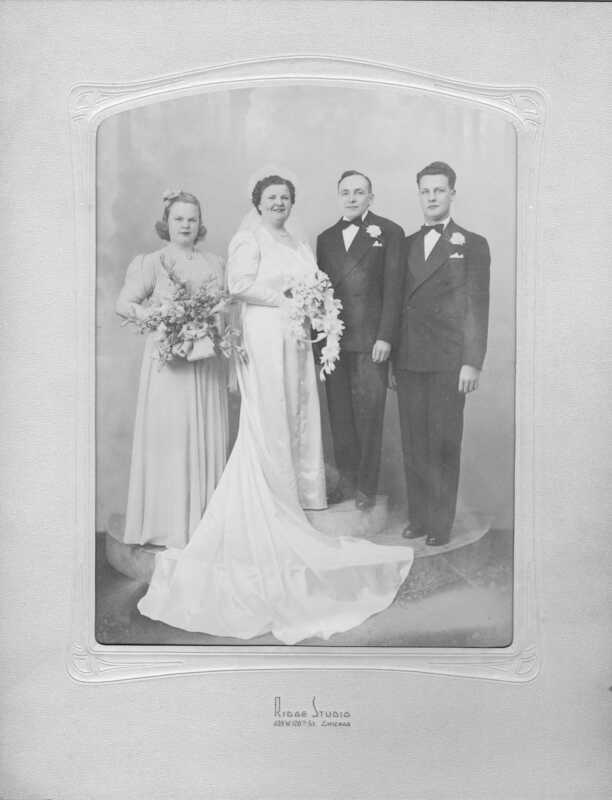 This wedding photo is an example of that, and it is posted here in the event a visitor to our website may recognize people in this photo. It was taken at Ridge Studio here in Chicago, 639 W. 120th St., and we believe it is circa 1950s. We want to know the Maxwell Street story behind this photo! Please contact the Maxwell Street Foundation at gro.n1555620528oitad1555620528nuoft1555620528eerts1555620528llewx1555620528am@of1555620528ni1555620528, or call (312) 243-0394 if you have any information about this wedding photo! All images published by the Maxwell Street Foundation within this website are copyright of the artist and are for educational, personal, and/or noncommercial use only. For any other use, please contact gro.n1555620528oitad1555620528nuoft1555620528eerts1555620528llewx1555620528am@of1555620528ni1555620528.